“Over here there’s still room,” he commented. The gentleman, part of a crowd in the large hall of the Cle Elum Putnam Centennial Senior Center, was sharing his reasons for why the lands of the Eastern Cascades are important to his family. They live on the West side of the Cascades, where cities and suburbs encroach more and more on recreational land areas. His comment, and the many others like it, point to a love of outdoor activities in any capacity, and room to enjoy them. 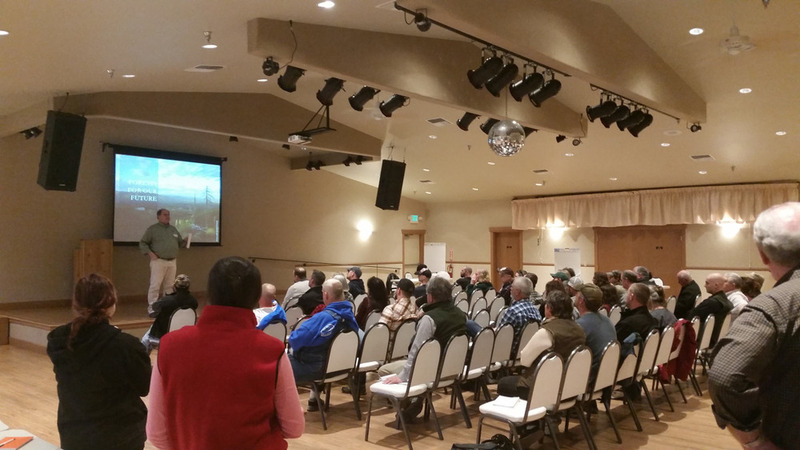 His comment was just one of many shared at the first of three community open houses focused on The Nature Conservancy’s purchase of forestland in the Central Cascades. Off road vehicle users are a huge interest group in places like Cle Elum, Roslyn, and Ronald. ATVs, side by sides, snowmobiles, street legal bikes, and more take thousands of people into the Cascades every year. Folks who love this form of recreation were active participants in the meeting. Others spoke of how the local economies benefit from tourists coming to enjoy the backyards of these towns. For others, the best use of the land is for nature – wildlife habitat, forest restoration and untouched wilderness. Since purchasing 47,921 acres of land from Plum Creek along the I-90 corridor, TNC has engaged interest groups of the surrounding communities in conversations about why this land is a treasure to those who live and play in the area. The open house, the first in a series of three, continued these talks with members of the general public. Everyone echoed the desire for healthy forests, wildfire protection, water quality and quantity, and recreational use of the land. Maps were drawn on, post it notes stuck up, and comments recorded. It was heartening to see so many people gathered because of a shared and deep love of this place. Those who made it to this event added important pieces to the conversation, and in the next two open houses, there’s still room.